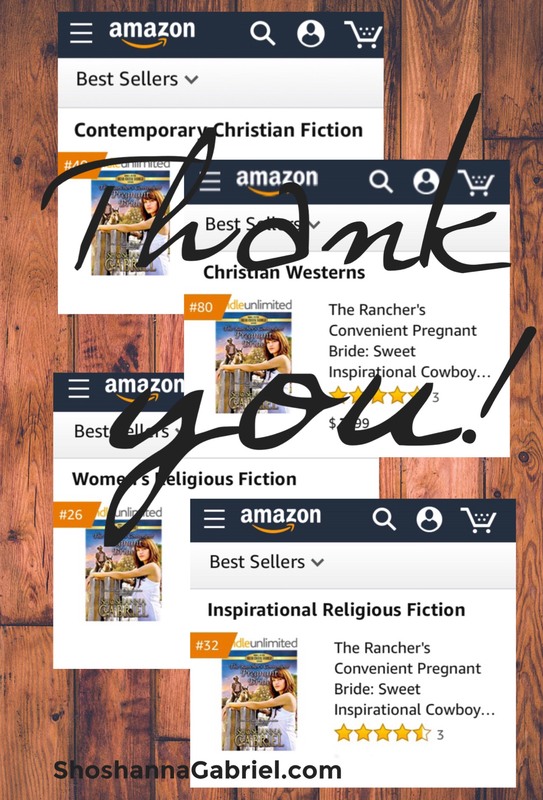 Dear friends, thank you SO MUCH for making The Rancher’s Convenient Pregnant Bride: Sweet Inspirational Cowboy Romance (The Bear Creek Saddle Series, Book 3) a bestseller in several categories in America and the United Kingdom on Amazon, including bestsellers in Contemporary Christian Fiction, Christian Westerns, Women’s Religious Fiction, Inspirational Religious Fiction, Christian Romantic Fiction, and Religious Romance! I can’t take any credit on this one… glory be to GOD alone. 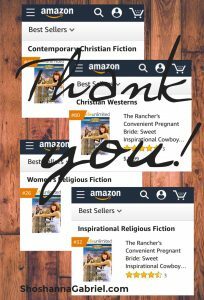 Without Him I wouldn’t even be writing Christian fiction! I’m honored to share with you an excerpt you won’t see in the sample pages! 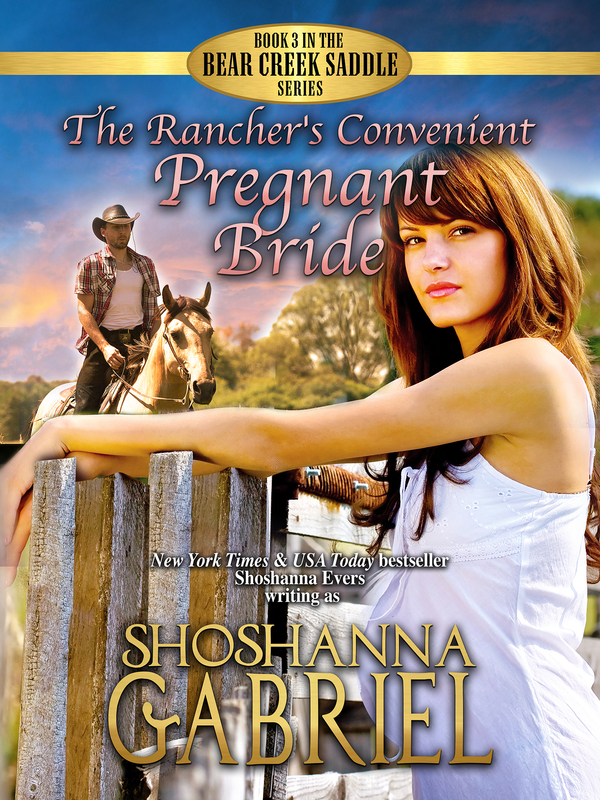 The handsome rancher has an offer for a modern marriage-of-convenience she just can’t refuse…for her baby’s sake. Eric Hunt, a handsome young rancher in the small mountain town of Bear Creek Saddle, Idaho, learns he can’t have children of his own. His desperate prayers to God for healing are answered with a crystal-clear vision: a beautiful woman with warm brown eyes — his future wife? — and she’s holding a baby. But how…and who? Across the country, Lindsay Moore’s glamorous Manhattan lifestyle is ripped out from under her when she falls victim to an investment scam, loses her job as an executive at the bank…and finds out she’s pregnant by a man who wants nothing to do with her, or her baby. Abandoned and heartbroken, Lindsay is done with love. When Lindsay’s sister asks her to come out to Bear Creek Saddle Ranch to be her maid-of-honor and help plan her upcoming wedding, Lindsay has nowhere else to go. But she’s completely out of place in the mountains, and without the sense of importance and identity her career and money used to give her, she feels lost. She’s no longer sure of her value, and she never imagined she’d be in this predicament…single, broke, and raising her baby without a father. Eric is the groom’s best-man, and when the bride-to-be’s beautiful sister Lindsay arrives, they find themselves drawn to each other, despite all of their differences. With those warm brown eyes, could Lindsay be the one from his vision? When Eric discovers Lindsay is pregnant, he knows God sent Lindsay to him for a reason. Eric wants to marry her and be a father to her baby, even if they’re not in love yet— she’s beautiful inside and out, and he feels called by God to make the proposal. For Lindsay, it’s a way out of the mess she’s made of her life — an offer for a modern marriage-of-convenience that she just can’t refuse. But can a man and a woman with nothing in common, find common ground…and maybe even love…before their child is born? Some context for the scene: Lindsay is pregnant and the doctor wants her off her feet after she fell, at least for the rest of the day to make sure she doesn’t have any more spotting (TMI?). Her sister is out of town, so Eric has volunteered (insisted, really) he bring her lunch in bed since he feels responsible for her fall. That’s the only reason they’re in a bedroom together…this book is clean and wholesome. Eric brought the tray into his bedroom where Lindsay lay, resting sweetly in his bed, with her legs elevated by a pillow under her knees. She clicked off the news on the television. They both ate in silence for a moment, their mouths too full to speak. Eric’s heart was beating faster now. Why had he gotten so personal with his prayer in front of her? God already knew what was in his heart. He didn’t have to pray that out loud…and yet he had. Because he wanted her to know. She laughed, as if she were joking, but Eric could tell it was a serious question. Did he just blow it? Was she mad he didn’t believe in love? But instead of glaring at him, she shook her head, as if in amazement. If anyone wanted to protect her and her baby, it was him. Could she see that? Did she know? That guy Grant didn’t deserve to be anywhere near Lindsay or the baby. “Be his dad,” Eric agreed. She stared at him in stunned silence, her lips parted. He hadn’t meant to just say that. It just came out of him, so naturally. He’d been agreeing with her. Of course, he’d be a positive male role model in her child’s life. He wanted to be even more than that. Eric could be a father-figure to her child, the way his own father had been for Zach, since Zach’s father had abandoned them. “Okay.” She still seemed almost out of breath, maybe unsure of either herself, or of what he would say next. Wow. Was this why God had shown him the vision of himself with a woman—Lindsay, surely—holding a baby? Lord, is this how You are giving me a family? Eric never expected direct answers to his prayers. He prayed and asked questions of God way too often, he figured, to get a personalized response on each one. Until the vision. His one and only vision from God. He was sure of it. But now, deep within himself, Eric could feel the answer. Eric grinned. Thank You, God. Thank You, thank You. Please don’t let me jack this up. “What are you saying, Eric?” She didn’t sound mad… just… curious? Excited, even? Was that possible? Did she want this too? Eric felt the Holy Spirit whispering within him as clearly as he could feel the softness of the quilt on the bed beneath his fingers. Her jaw dropped, her mouth opened like a small letter O, and she stared at him with an expression of pure surprise. Heat rushed to his ears. Hopefully in the dim light of the bedroom she wouldn’t notice, but he turned his head and stared at the embroidery on the quilt instead of looking at her intense gaze. Lord, give me the words. If this is really Your will, help me out. “No.” He sighed. Telling her everything would make him sound out of his mind. But the truth was all he had, and she deserved to know why he felt so confident they’d make it, despite having just met her. Please don’t let me mess this up more. Help me. There. He’d said it. Now she knew. “In a photo,” she suggested. Lindsay didn’t look nearly as taken aback as his brother had. He liked how she was taking it all in—she didn’t dismiss it right away like his brother had. As if maybe, just maybe, he was valuable enough to God to get a special vision created specifically for him. To have a gorgeous woman in front of him who believed in him that way…how could he give that up? Lindsay couldn’t believe what she was hearing from Eric. But it was the answer to her prayers. Was it “settling” if she married someone when they weren’t in love, even if they had the same Christian values and the goal of raising a happy, healthy child together? Not really, not if she didn’t want to get so attached to a man that she ended up completely destroyed when the relationship ended—which it would—either by divorce, abandonment, or, best case scenario…after many decades together, right when she was completely and utterly in love and not whole without him…death. Just like what had happened to her dad when her mom died. By accepting Eric’s proposal, could she be missing out on the perfect man for her? Unless this was God’s plan all along. And Eric was, in fact, the perfect man for her. What did “perfect” mean, anyway? A hundred years ago, marrying a wealthy, educated man was considered the perfect match. And while Eric wasn’t like the hedge-fund managers or lawyers from New York that she’d previously dated, he was still an incredible guy. NOTE: Fro m March 23rd-27th, 2018, you can get Book 1, Second Chances for Trampled Hearts, normally priced at $3.99, for just 99c on Amazon here! 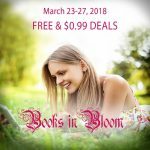 Check out these other Christian romance “Books in Bloom”, free and 99 cent ebooks perfect for springtime! ← Were you 1 of 100 winners given the WRONG BOOK???? Goodreads Giveaway MIX-UP! !